My former colleagues used to call me the ‘capital letter Nazi’. 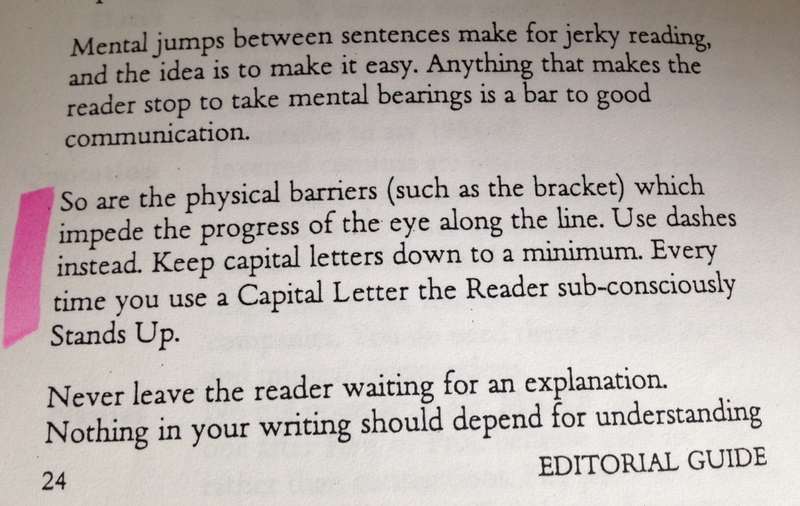 So I think I’m well-placed to share a piece of copywriting advice that will help you make your writing easier to read, remove distractions – and avoid incurring the wrath of copywriters and journalists everywhere – keep your use of capital letters to a minimum. Littering copy with capital letters is my biggest copywriting bugbear. I’ve been known to become enraged by the incorrect and inconsistent use of upper case letters. First world problem, I know. However, it is without doubt the most common error I have come across when editing copy in the organisations I’ve worked for since I left the magazine world. Print publications use minimal capitals because capitals distract the eye as it travels along a line of copy, and as a trainee journalist I had it drummed into me to keep capitals to the minimum. However, when I left the world of journalism I found – to my horror – that capitals were being thrown about with gay abandon. I have spent hours of my life slashing out capitals from countless newsletters, annual reviews, press releases and articles. Muttering under my breath as I went. Why does it annoy me so much? Maybe it’s because it’s grammatically incorrect. Or maybe it’s the self-aggrandisement that capitalisation implies. What is so impressive about your Summer Ball Committee, or your Managing Director that they need their importance pronounced to the world with a capital letter? In most newspapers even the queen doesn’t get a capital, and neither does the president of the USA or the prime minister. The Summer Ball Committee will meet in the Boardroom. The Company will give Employees that reach their Sales Targets an Annual Bonus. Capitalisation doesn’t add authority to your words, ideas or to commonplace corporate committees. Explaining properly what it is about them that is important or interesting does. In fact aggrandising every Programme, Service, Association, or Whatever New But Not That Interesting To Anyone Else Thing you think is important just makes what you’re writing harder to read. Capitals get in the way and stop a readers train of thought – perhaps to wonder why on earth that word is capitalised?! Anything that stops a reader in their tracks is to be avoided, because that’s when they’ll click away, or get otherwise distracted from the juicy information you’re trying to share with them. To add insult to injury – I love a good cliche so I don’t play entirely by the rules of good writing – this flagrant abuse of capitals usually isn’t abused consistently. In one sentence your Totally Dull Initiative has a capital but in another its doesn’t. When the Roman alphabet developed there was only one case – capitals. Lower case letters were developed with the advent of printing to making writing – and also reading – quicker. A whole page of capital letters looks very dense on the page whereas words written in lower case are easier to recognise because they have a particular shape, due to the way some letters rise higher and others drop lower. Trivia time: While researching this article I found out that the term ‘lower case’ comes from the days of hand typesetting when that case of letters were kept underneath the case of capital letters. Historically capital letters were used to denote formality. If you look back through newspaper archives you’ll find that capitals used to be used far more than they are now. Thankfully we now live in less formal, less deferential times and the predominant use of lower case in publications today reflects that. When should we use capitals? I take my lead from newspapers and magazines on this. They all use sentence case – capitalising only the first word and proper nouns. The exception to this heading rule, for some reason, is book titles. Check out the undisputed king of the headline, The Sun newspaper for instance. They know way more about getting readers to stop and read on on the strength of a powerful headline than you or I, and every one of their headlines is sentence case. Many bloggers and digital marketing gurus capitalise every word in a heading, but while obviously it’s not the end of the world, if it works for you it works for you – but it makes the journalist in me cringe. When I add content to my Buffer schedule, I go through the article headings that are automatically pulled from the metadata editing out capitals – if I have time. If you follow me on Twitter, you’ll notice when I must have been pushed for time, or exhausted, because the capitalised headings slip through! Oh and before anyone pulls me up on it, I’ve chosen to fully capitalise the headings on this blog because it works with the layout and font. But usually I would use sentence case. Tips to help you avoid crimes of capitalisation? Titles where they are used as part of someone’s name: President Obama or Queen Elizabeth. Job titles/functions: the prime minister, our head of marketing, our chief bottle washer. Extractions of organisation names: the company, the charity, the association, the journal. Services: social media management, copywriting service. My rule of thumb? If it doubt, use lower case. Or if you have time do a quick search to find out see whether a publication you respect capitalises the word in question or not. I usually refer to The Guardian or the BBC. The biggest rule with capitals, as with so many things, is consistency. If you decide to capitalise a product name, or to use title case for your headings, then do it all the time. Nothing looks more shoddy than inconsistent use of capitals – well maybe bad spelling and terrible punctuation, but I’ll leave that for another time. At the end of the day it’s up to you what you capitalise and what you don’t. I know not everyone is as offended by overuse of capitals as I am! My advice is shared with the intention of helping you make your copy easier to read and to minimise distractions for your readers. So go ahead and check over your copy for crimes of capitalisation and let me know your views on the subject in the comments. All of the yes! As a content editor I’ve coined the affection “chronic capitalization syndrome.” Sometimes it’s sooo random – like “I think it’s Great.” That makes even less sense than capitalizing a title that shouldn’t be capitalized. When I first read your headline, I figured it would be about overuse of caps lock – hate that even more, especially in a CMS where are so many other ways to make text pop. And overusing exclamation points. So. many. pet. peeves. Oh I do love finding compatriots in the campaign against over-capitalisation! And you’re right those random, from nowhere Capitals are just as Annoying! ;) Now I feel bad about my caps lock headings though…must sort out that font! I also thought at first that this post was going to be about caps lock, but this rant was just as good! Random capitalization just doesn’t make sense, so I’m glad to see you educating on the basics of it. Also, that lower case fact is awesome. I’ll be using that one in conversations now, ha! If two of you thought it was about caps lock, I’m starting to think I should change the headline! ‘Random and inconsistent capitalisation’ perhaps! Either way, very glad you appreciated it Robyn! Love your new site by the way. This is something I’ve always been unsure of, especially for headings/subheadings. I feel a lot more confident now – thank you! A snippet taken out of context.